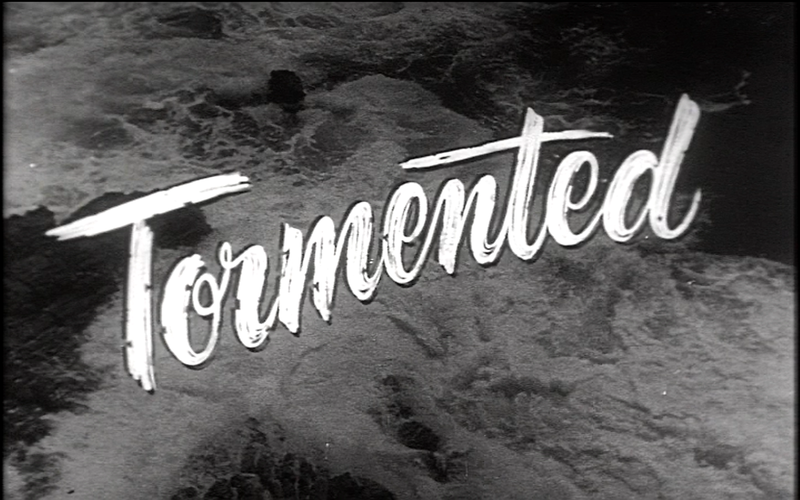 Cinema Sunday: Tormented (1960) | Magazines and Monsters! I’m sure everyone out there has a movie star crush. Well, in this case, I’m spotlighting a movie with one of my “man crush” movie stars in Richard Carlson! This guy was quite the tough guy/leading man back in the day, and when you look at his resumé, you cannot deny his place in movie history. And honestly, he fought the ‘Gill Man’ in Creature from the Black Lagoon, so does he really need anything else to be said about him? Exactly. In this film Carlson is somewhat of a cad, and you don’t feel one bit sorry for him when he gets what’s coming to his way. He’s typically the strong, macho type, that is the hero, but not in this film, oh no. Rather than boring you, why don’t we get to the plot! The film opens with a voice telling that the nearby island (near Cape Cod) holds secrets, voices from the dead! Close by, a lighthouse has two people in it. A beautiful woman, Vi Mason (Juli Reding), and Tom Stewart (Richard Carlson), argue over their past relationship. Vi wants Tom back, but he’s engaged to be married to a much younger, and more wealthy woman now, so he couldn’t care less about Vi. This infuriates her, so she tells him that if he doesn’t consent to be her husband, she’ll produce a letter that he gave her a while back, stating his lover for Vi, and it will ruin his engagement to his new lover. You can see the desperation in Tom’s eyes, and then the two continue to have a back and forth argument on the gallery. She even threatens to ruin his musical career (he’s a successful jazz pianist apparently), and this really twists Tom’s nips. He throws her a really evil look, and she remarks that he looks as though he wants to kill her. Just as she smirks at him, the railing she’s leaning against lets loose, and she falls. She manages to grab on to the deck but needs help getting up…but Tom realizes her “accident” means an easy way out for him. He watches as she plummets to her death on the rocky shore below. The next morning, Tom dives into the waters to recover her corpse. He does, and then brings it to shore. Once there though, it turns into a pile of seaweed! A voice then cries out and startles Tom. 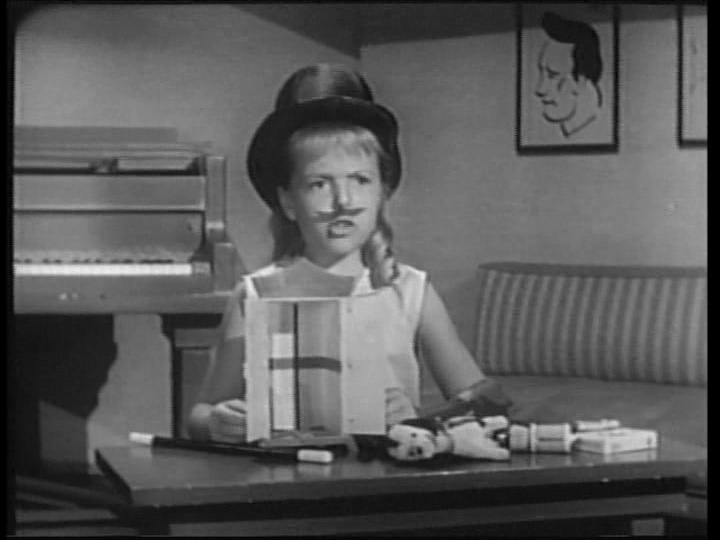 We see a little girl (Susan Gordon) approach who’s the younger sister of the woman whom he’s going to marry. Sandy wants to hang out with him, but Tom is quite shaken over recent events, and wants to be alone, so he asks her to get lost. As she’s ready to leave, she notices something shiny nearby. She picks it up and shows it to Tom. It’s a very nice watch with the name Vi on the back, and she asks him if he knows anyone by that name…Tom denies knowing anyone by that name of course, but wonders what is going on. Sandy runs off to play. Tom begins to have an internal monologue and thinks his imagination is getting the better of him, so just leaves the beach and heads over to the lighthouse. He heads up to retrace the steps from the night before, and then tries to pull the railing back in place, but it wont stay, and keeps going right back into the same spot. A seagull flies by and scares the crap out of him, and then he hears someone enter the lighthouse. As the steps get closer, Tom’s sphincter tightens. We then see a gorgeous young woman approach, and Tom can breathe easy. It’s his fiancée, Meg, and she’s elated to see her man. The two have a few moments, but then she decides it’s too creepy in there, so she wants to go back to the beach. As they leave, you hear a mysterious whaling noise from the lighthouse. As the two lovers walk along the beach talking about their wedding ceremony (one week away), the camera pans down towards their footprints in the sand. As they continue on, we see that just behind them is another set of footprints being made, but from no one we can see. As the two stop to make out, Tom notices the extra set of prints, and freaks out. Meg doesn’t understand, and when Tom tries to point them out, the ocean washes up and erases the tracks. Tom gets frantic, and begs Meg to go away with him to the mainland now and get married, but she refuses, and tells him that her father would go berserk. Tom is left wondering what to do, and again, we see a set of footprints right next to him! The next day, Sandy is trying to show Tom her new magic show, but he couldn’t care less. Sandy gets angry, but forgives him. He asks her to get the magic show ready for another time while he practices his music. He begins to play, but out of nowhere, the record player turns on by itself. Tom notices the name of the song is “Tormented” by an artist with the first name “Vi” so he unplugs the record player. He heads back over to the piano, and just as he’s about to begin playing again, the record player starts up again! He runs over and smashes the record. Just then, he hears a knock, so he calls out, and gets an answer from Mrs. Ellis (Lillian Addams). She’s was a local real estate agent that he knows, and she just stopped by to pay him a visit and see how he’s doing. She’s blind, but knows the area very well. He begins to ask her questions about local ghost stories and her personal superstition. She tells him that there is a strong presence in this area, and just down the block they had an incident years earlier. That night, Tom is dreaming (or is he) that Vi’s ghost is calling out to him, begging for help on the lighthouse once again and just flat-out taunting him. After wetting the bed, Tom wakes up, and that watch is on the nightstand. As he looks out of his window, he sees the light is on up at the lighthouse, so he bolts up there to check it out. He calls out to Vi, and initially gets no answer. As he heads out, a voice answers him, but it’s too late. The next day, he’s doing his thing again at the piano, and Sandy drops by to annoy him. He shows her the wedding ring and she asks if she can try it on. He turns away, and gets the ring out of the case, and thinks he’s slipping it on to the child’s finger. A minute later, she again asks if she can try it on, and he tells her that he just gave it to her, but she tells him that he didn’t. Just as he turns back around, he sees Vi’s floating hand wearing the ring! He freaks out, slaps the hand down, and backs up. Sand y doesn’t understand what’s going on, and she thinks he’s dropped it. She looks under the piano, and then Tom can see the creepy hand crawling around with the ring. As Sandy gets near, he pulls her away, and the hand then disappears. Will Tom make it to his wedding day? Or will the ghost of Vi get her revenge?!? Being a film that’s in public domain, give it a look. Richard Carlson is a strong actor, and gives a very solid performance. Nothing Oscar worthy, but definitely worth giving this one a try. The rest of the cast isn’t anything to write home about, well, the little girl has some funny scenes, and the ladies are very beautiful, but they could’ve been anyone. 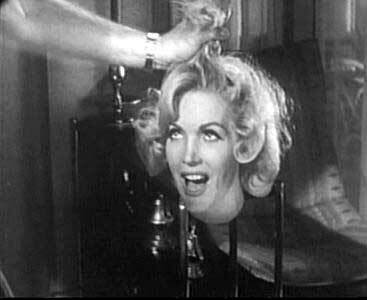 Lillian Addams was pretty good, not only at portraying a blind woman, but also at being a sort of medium. The sets were OK, but the real cool scenes were in the lighthouse. That was something cool, and really added the atmosphere to the flick. There wasn’t much else, and the music score was kind of generic, but hey, Bert I. Gordon films aren’t really known for the big budgets and elaborate music scores. The special effects were decent for a low-budget film, and didn’t pull down the supernatural tone that the movie was trying to give you. Seeing Carlson’s character mentally decline is half the fun of the movie, but once the blind lady senses something wrong, then it gets really interesting. I’ll add a link to the full movie so you can decide for yourself!